Learn how to prepare for a successful Back-to-School Night or Open House! On this page (which has been excerpted from The Cornerstone book) You’ll find tips and tricks for making parents feel welcome, handling small children who attend, and creating an engaging and memorable presentation. Open House (or Back-To-School Night) can be a source of great stress for teachers who hate speaking in front of a group of adults. It’s natural to be nervous and concerned about creating a good impression on the families you will have to partner with for an entire school year. One of the most important elements of a successful Open House is letting your personality shine through so that parents can make a real connection with you as a person who cares about their children. The following guidelines will help you feel calm and prepared so that you can let parents see the real you: a person who loves their kids and wants to help them succeed. It’s helpful to send a letter to families to introduce yourself, provide an overview of the school year, and inform parents of rules and procedures. If you send these letters out before Open House, you won’t have to go into as much detail in your presentation because parents will have already had a chance to familiarize themselves with how your classroom is run. You can also use your letter (or a class handbook that you provide in advance) as the basis for your presentation. The purpose of Open House or Back-to-School Night is to provide a time for parents to meet the teacher and review expectations. It is NOT a time for individual conferences, and you’ll need to make that clear to parents. Open House is usually held in the early evening and lasts between 30 and 90 minutes, depending on the format that your school uses. In some schools, the teacher will need to present for as long as 45 minutes; in others, the teachers are lucky to get 15 minutes. Ask your colleagues what Open House is normally like at your school. 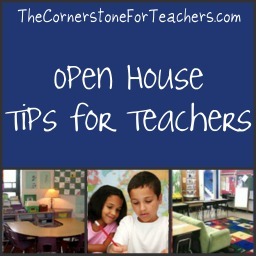 There are several components of the typical Open House. Some schools have parents go to the cafeteria or auditorium first for a general welcome, then to individual classrooms. No matter how your school sets it up, you should expect to have families trickling in for a good 30-45 minutes, if not longer: some will be very early, and others will come in when it’s nearly over, especially if they had to visit siblings’ classrooms first. The younger the children you teach, the higher the priority parents will give to your classroom. Pre-K and kindergarten classrooms often get the best turnout in the school and parents will visit them before going to their older children’s classrooms. Some schools have two 30-minute sessions so parents with more than one child can visit multiple teachers without missing a lot of information. After most people arrive, you will give a short presentation about your class. However, because of the trickle-in effect, you will need productive activities for your families to do while they wait for you to begin. Talking with you will not be an option as you attend to a million other things that seem to pop up. Open House is not always the best time to have parents fill out forms because they are often rushed and distracted. You can, however, have volunteer sign-up sheets for them and handouts to peruse. Have a self-running sign-in system that you don’t have to operate yourself. Right inside my classroom door I have a desk with nametags, a sign-in sheet, and a packet of materials that I will be reviewing that night. (If you place the desk in the hallway, you won’t be able to ensure that all parents have signed in.) Some teachers like to offer a small bowl of candy or treats, as well. My sign-in sheet asks for the parent’s name and the child’s name, as well as a daytime phone number, so that when conferences come, I don’t have to rack my brain wondering, “Did I meet her before? Didn’t she come to Back-to-School night, or was it dad that came?” I have introduced myself to the same parent several times, only to have them say, “Yes, I remember…we met at Back-To-School night.” Whoops! There will be dozens of people in and out of your room and family situations can be complicated, so it’s very hard to keep track of everyone. Make notes to yourself in the margin afterwards (woman with red hair, had infant with her, grandma came along, didn’t speak much English, etc.) to help you place the name with the face later on. Make it clear where parents should sit: normally, at their child’s desk. Some teachers like to have work samples or other materials out; I have done this in the past and found that papers wind up on the floor or somewhere else they don’t belong in all the hustle and bustle. Have extra chairs available for families to sit together. You may want to have all the children sit on the floor in the front or back of the room if space is limited. Scavenger hunt: Families can complete this activity while they wait for you to begin the presentation, and/or afterward while they wait to talk to you. One parent sent me an email afterward saying how much she enjoyed it because she had a purpose in walking around the room and knew what she was looking at. The scavenger hunt can end with the parent at the child’s desk, waiting for you to begin talking. How well do you know me? Fun survey: Parents can complete this at anytime during the evening–it’s waiting for them on the child’s desk. The kids get to grade it for the parents the next day, which they love! Note: Have something enjoyable to do the next day for the kids whose parents couldn’t come so they don’t feel left out while the others read the surveys. Shared journal entry: The kids write on a topic such as “The Hardest Part/Best Part of Being a Kid”. They then set up the page across from that page with the title, “The Hardest Part/Best Part of Being a Parent”. The families complete the journal entry at Back-To-School night and children read them in the morning. (Have another morning warm-up for kids whose parents did not come.) This is a good activity if you use journals and workbooks a lot: it lets parents see how much work the child is doing in class, even though it may not all come home because it’s not on loose-leaf paper. Be aware that some parents may not feel comfortable with their own reading or writing skills or may be preoccupied with their young children or the papers you have handed them, and may not take part. I have had moderate success with this activity in that regard, but the parents who did do the journal entry absolutely raved about it. 1) Tell a little about yourself. If it’s your first year teaching, don’t feel obligated to announce that, but definitely don’t lie, either! At my first Open House, I said, “This is my first year teaching this grade level,” and left it at that. Some teachers show their family photos, which can be very endearing and encourages parents to view you as an approachable, real person. I like to tell why I chose the grade level I did and what I think is special about it. This is a good transition into the presentation and if someone comes in late, they’re able to catch up easily. 2) Give an overview of the most exciting things you have planned for the year to get parents enthusiastic about what’s happening in the classroom. I spend just a minute or two telling them that their children will be choosing community outreach and charity projects to get involved with, doing a home and school fitness plan, and so on. Be sure to mention anything out of the ordinary that you plan to do (specific field trips, etc.) that sets your class apart. 3) Use your daily schedule to introduce parents to the way their children will be learning. This is the ‘meat’ of your presentation. Without burdening them with too much detail, walk your families through the children’s day, from Morning Work to dismissal procedures. Each time you mention a specific subject area, explain how it will be taught. For example, you might mention small group reading instruction, centers or centerjobs, integration of content areas (such as using social studies to teach reading comprehension strategies, etc.). Use photos of the kids working or actual materials as props to keep everyone focused. I like to also call on kids who are in attendance to explain things (“Would one of our class members tell how we use the math games?”). This gives parents a break from listening to me talk and it’s always entertaining to hear the kids’ explanations. 4) Spend no more than a minute or two discussing standardized tests. You can also mention your grading system or scale if necessary, but in the primary grades, this shouldn’t be a big deal. Do NOT get bogged down with state standards and outcomes–you can provide these in a handout and parents can read them later. If your grade level doesn’t give any standardized tests, you could even skip this altogether. Let parents know that all of your instruction and assessment is aligned with state standards, and in plain English that means you design all of your lessons to meet state requirements in order to prepare students for the tests and for the next grade level. Tell them that you will be providing handouts, conferences, benchmark tests results, workshops, etc., throughout the year to help them understand the testing expectations, and that your communication with them will be routine and ongoing. Promise that there will be no surprises and that they will have an indication if their child may have difficulty passing long before the actual test date arrives. 5) Outline your approach to behavior management and class rules. Make your expectations clear now so parents know what to expect! For example, if you never accept late homework or papers without names on them, are a stickler about tardies and make-up work, or don’t let kids call home when they forget a book or agenda, explain your philosophy up front. I wouldn’t run down a list of no-no’s, but I do explain that I make class rules and consequences collaboratively with the students, and send them home in writing for parents and students to sign. (By Open House, this is usually done, anyway.) I tell them that after a grace period, which usually ends around October, I enforce the rules without exception in order to be fair and to teach the students responsibility and accountability. For example, one year I decided that all no-name papers would have one letter grade taken off beginning in November. When a parent called to complain once, I reminded her of the written notice and announcement of that policy at Open House. If you can’t discuss these things at Open House due to time constraints, be sure to have them in writing so anyone with concerns can bring them to you before they become a problem. End this portion on a positive note by explaining the reward systems and fun activities you have planned for the students (Fun Friday, etc.). 6) Close with the methods of communication you will use (newsletters, email lists, class webpage, daily agendas, and so on). If parents are welcome to volunteer in your classroom, briefly explain the procedures for this as well. If you want them to sign up for volunteer opportunities or specific classroom tasks, tell them where the sign-up sheet will be and encourage them to add their names to the list after the presentation. Be sure to thank them for coming out and urge them to call, email, etc., anytime they have a question or concern. Let them know that due to time constraints, you’ve been specifically instructed not to discuss any individual students during Open House, but that you have a conference sign-up sheet available for that purpose. 7) Explain how you will handle parent questions. One year, things were very calm and settled and I took questions and answered them in front of the group for about five minutes. Another year, things were very hectic and I asked parents to either approach me individually with questions or write them down and I would call them the following day. You may begin taking questions and realize that parents are asking things that only pertain to their child or a small percentage of the class; you can always give a general response and tell the parent you will follow up with them later on (give a specific time and method of communication). If you notice that a lot of side conversations begin and the whole group isn’t listening anymore, they’ve probably had enough ‘lecturing’ for the evening and you can end it! With some groups, I can literally see how tired they are from working all day long and then rushing to the school and sitting through lengthy presentations, knowing they still have to get home and bathe the kids, do homework, get everyone ready for bed…and then get up again in a few hours for another work day! Make it brief for those groups. You can also help by not assigning homework on Open House night, or excusing it for the students of parents who attend (that’s always a great motivator for kids to get their families to show up!). * Does the teacher like my child? * Does the teacher care about the kids and enjoy teaching? * Does the teacher want to support me and my child? * Is the teacher going to be fair and easy to work with? These things are communicated through the energy you put out and the environment you create in the classroom. Some of it can be communicated verbally, but most of is conveyed in your demeanor. Smile! Smile! Smile! Act relaxed even though you’re not. Listen attentively to parents and treat their questions and concerns seriously. They are not your superiors there to observe you, so don’t be intimidated. They are your equals, so treat them with kindness and respect and don’t worry about what they’re thinking. Most of them are extremely grateful to have you in their children’s lives, and want to support you in having a successful Open House and school year. Ideally, you should be able to connect with parents and make them feel valued and appreciated in the same way you treat your students as unique individuals. That can be difficult to do during Open House when you’re short on time, but I try to always say something specific and positive to each parent as we meet. (“Oh, you’re Edward’s dad! I am so glad to meet you! He is such an awesome kid; he always has some fact to share with the class! Just the other day, he said…” or “Brianna’s mom! Great to see you again! Brianna is the sweetest child; I can always count on her to help her friends and to be a peacemaker. I’m so glad she’s in our class!”) No matter how awful a child has been in class, it’s possible to find some good attribute to comment on so that the first feedback a parent hears is a compliment. The type of quotes above could easily be used for challenging students: Edward, for instance, could be a child who talks non-stop in class about totally random information, and Brianna may be a busy-body who’s always telling the other kids what to do. Look through to each child’s heart and intentions, and you’ll be able to come up with something good to say about all of your students. Plan it out in advance for certain children if you need to. There’s a lot of pressure on teachers to say everything they need to about behavioral expectations, homework, testing, grading systems, key skills and concepts, and how to support learning at home…all in one night! It’s just not possible. Parents, like kids, need time to digest information and make it their own, and hands-on experiences are the best way to do that. I hold a parent workshop each month, but I know teachers who hold only one a year or one a quarter. Start with whatever you are comfortable with and use parental feedback to determine what to do the following school year. I hold a variety of festivities, some of which are just opportunities for families to socialize with one another and build a sense of community. After each event, there is an evaluation form for parents to fill out to help me revise for next year. In the past, I have used an idea that I got from a Mailbox publication: I converted my open house discussion topics into a student-friendly readers’ theater. I allowed the students to have free reign (for the most part) of how they were going to present their part, what props (if any) they were going to use, etc. Throughout the first week of school we practiced. After that week, we video taped the readers’ theater. This taping is what I showed during parent open house. It was especially fun for the students because they kept it a secret from their parents so it would be a surprise on the night of Open House. I got a lot of positive responses from the parents about the creative idea. This was not only a great way for the students to practice fluency, but it also a different way to teach the classroom expectations and rules! What a fabulous idea! I love the concept of kids helping to present the Open House info–it helps the kids internalize your classroom expectations and makes it far more engaging for the parents! Half the time, in my experience, kids show up to Open House, anyway, so they might as well get involved. Thank you for sharing! You’re welcome, Nancy! Thank you for the kind words! Good ideas. Funny how we avoid the talk of all the Standardized Tests the politicians are forcing upon everyone involved. One of the reasons many parents and teachers are so upset about this. There is a big avoidance about this topic while millions are being sent out of our states to the testing big corporations. Why are they also forcing students to take so many tests in High School or they are penalized for not doing so? Great Article. Thanks for the info, super helpful. Does anyone know where I can find a blank parent letter form to fill out? Angela….you are simply the BEST!! I know I’ve said it before, but as a veteran teacher always willing to learn and grow, I could not appreciate your help with everything!! I feel like you are walking this journey with me :). Thank you so much for sharing all your amazing ideas. Angela… you are simply the BEST!! I know I’ve said it before, but as a veteran teacher always willing to learn and grow, I could not appreciate your help with everything!! I feel like you are walking this journey with me :). Thank you so much for sharing all your amazing ideas. Thank you very much for writing this outstanding article. I am not a teacher, I am a parent that is grateful and thankful for all the awesome teachers. I would like to know if you think it’s appropriate for a teacher to spend 45min discussing an event that happened with about 4 students in the classroom on curriculum night. We did not get a chance to discuss anything about the curriculum because the discussion was based on how we should be parenting our kids. I’m sorry that happened. It wouldn’t be right of me to try to make a judgment about this situation after hearing only one side of the story, and I can’t even begin to speculate about what happened here. I think you should take your concerns directly to the teacher–request that an admin be present if you don’t feel like you’ll be taken seriously. I hope that it works out for you!